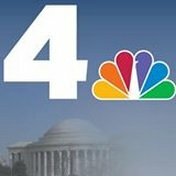 News TV Channel / WRC-TV, virtual channel 4 (UHF digital channel 48), is an NBC owned-and-operated television station licensed to the American capital city of Washington, District of Columbia. The station is owned by the NBC Owned Television Stations subsidiary of NBCUniversal (itself a division of Comcast). WRC-TV's studios and transmitter are co-located on Nebraska Avenue in the Tenleytown neighborhood of northwest Washington. WRC-TV houses and originates NBC News' Washington bureau, out of which the network's long-running political events program, Meet the Press, is based.